Another historic City of London view, this one dates from 1677 when construction of this memorial to the Great Fire of London was completed. Located just a stone’s throw from the site where the fire of 1666 apparently started (more on that in our earlier post), the 61 metre high Monument was designed by Sir Christopher Wren and Dr Robert Hooke with a platform viewing platform set just below a stone drum and gilt copper urn from which flames emerge in a symbolic representation of the fire. 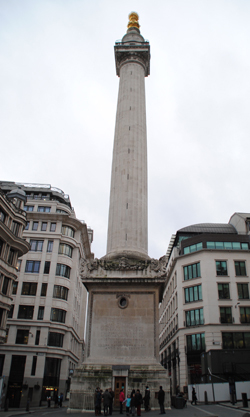 The viewing platform was intended as a place where Wren and Hooke could conduct experiments for the Royal Society (to this end, the Monument also features a laboratory in the cellar while its hollow shaft was designed to accommodate experiments with pendulums, its staircase steps measure exactly six inches high so they could be used in experiments on pressure and there is a trapdoor in the top of the orb to facilitate use of a telescope). Vibrations caused by the traffic on Fish Street Hill, however, caused problems and so the idea was abandoned and the platform, located at a height of about 48.5 metres, was left to the public. A mesh cage was added to the top in the mid 19th century, apparently as a preventative measure after a number of people had leapt from the top. The cage was replaced in 2008 as part of a major, £4.5 million, 18 month-long restoration of the Grade I-listed structure. While people are welcome to climb the 311 steps to the top on a circular staircase that winds its way up the inside of the pillar to take in the views over the City and Thames (and about 100,000 d0 so each year, gaining themselves a special certificate for their efforts), for those who can’t make the climb, equipment enabling the streaming of live video images, taking in a 360 degree panorama from the top of the Monument, was installed as part of the restoration. These images can be accessed via the Monument’s website. The images, which take in the city, are updated every minute.